Timed to coincide with the Bicentenary of Edward Lear’s birth on 12 May 1812, Huyton Gallery presents For the Love of Books, an exhibition in which copies of some of Lear’s most famous publications are juxtaposed with a playful collection of new works by contemporary artists. Curated by Tina Ball, the exhibition’s premise is that between 1832-1836 Lear was engaged at Knowsley Hall by Edward Stanley, the 13th Earl of Derby to sketch the estate and the birds in the Earl’s menagerie. Lear had initially produced poems, limericks, drawings, alphabets, and menus for the entertainment of the children at Knowsley, and in 1846 Lear combined these ‘nonsenses’ with his own unique illustrations in A Book of Nonsense. The patronage of the Earl of Derby would go on to shape the entire course of Lear’s career. Like nonsense verse as a whole, we can also link Lear’s work to twentieth century aesthetic movements such as Surrealism and the Theatre of the Absurd, themes which are echoed in the often fantastical works of contemporary artists Jo Howe, Julie Dodd, Elizabeth Willow and Lucy E. Wilson amongst others. Elizabeth Willow combines elements of bookbinding, embroidery, origami, montage and détournement to create evocative works inspired by mythology and storytelling. With titles such as Once upon a Time, The Dark Forest and A Dream, Willow’s paper sculptures, collages and collections of found objects appear other-worldly, as fragments of memories or long-forgotten dreams. 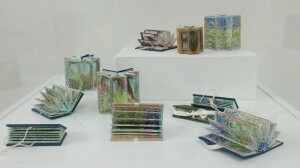 Similarly, Lucy E. Wilson’s intricately layered ‘carousel books’ open up to provide snapshots of ethereal worlds which we may never inhabit. The fantastical theme continues, as books become butterflies (Jenny McInally) and trees (Julie Dodd, Hilary Judd), whilst Emily Whitebread’s Search for the Invisible, a letterpress printed ‘Catalogue for Detecting Mystery Riders’, is presented as a series of blueprints which might hail from a simultaneous reality, another Earth. 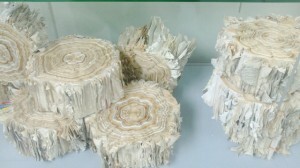 Working with old manuscripts, Jo Howe deconstructs and reimagines the formal components of the book itself, challenging its physical permanence by the removal of text and page in order to generate new layers of meaning – a visceral response based upon form as opposed to content, or to words which frustratingly remain unspoken in a broken chain of communication. 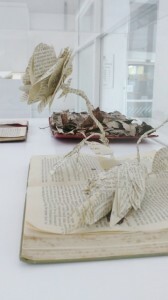 Aside from its connection to Edward Lear, the exhibition also takes as its focus the term “artists’ books”, described here as “a broad definition which has developed from an early idea of works illustrated by artists through to book transformations where books themselves are deconstructed and reconstructed in new forms.” In this vein, the exhibition also features a variety of works loaned from the Special Collections of Manchester Metropolitan University including those of Cheryl Pilling, Ray Fisher, Ronald King and Mette-Sophie Ambeck, all of whom are continuing the legacy of the artist’s eternal creative experimentation with the medium of the book. Most notable in this show is the recurring contrast of the decorative with the stark and structural, as we move from the torn fragments of imagined worlds to precise geometric constructions. Despite their obvious eclecticism, what could have been a somewhat disjointed collection of works are brought together by the power of their subject matter. Situated in Huyton Gallery, adjacent to the local library, For the Love of Books demonstrates the enduring power of the book to inspire and to provoke an emotional response in a digital age. can be seen in the new Knowsley Leisure & Culture Park on Longview Drive, Huyton.